Tue 09 Apr 2019 Elaine Taylor - Smithills – Bolton. Tue 12 Mar 2019 Paul Hindle - Maps and Turnpikes in Lancashire. Fri 08 Mar 2019 Annual Dinner - at the Seaview, Whittle-le-Woods. Tue 12 Feb 2019 Dr Bill Shannon - Hell Holes, Moss Houses and Meanygates. Tue 08 Jan 2019 Ian Bagshaw - The Royal Mail & Secret Language of Postcards. Tue 13 Nov 2018 Alex Houghton - A History of Red Poppies & White Poppies. Tue 09 Oct 2018 Doreen Jolly - Sir Henry Tate. Tue 11 Sep 2018 AGM and members' reports - a review of the year's visits, outings and projects. Tue 14 Aug 2018 Dave Joy - Liverpool Cowkeepers - A Family History. Sun 08 Jul 2018 John & Christine Harrison - CHAS trip to Edinburgh and Jedburgh. Click here for more information. Tue 12 Jun 2018 Elaine Taylor - In a Monastery Garden. Tue 08 May 2018 Stephen Gill - History of Photography & Photographic Restoration. Tue 10 Apr 2018 Barrie Walters - Victorian Scientists & Engineers in Lancashire. Tue 13 Mar 2018 Malcolm Tranter - Historic Western Cyprus. Tue 13 Feb 2018 Paul Atherton - Viking Voices - True History 902 - 917 AD. Tue 09 Jan 2018 Boyd Harris - People & Mountains of North East Nepal and 18th century border invasions. Tue 12 Dec 2017 Social evening with quiz. Tue 14 Nov 2017 Maria Sumner - Three Lancashire Suffragettes. Tue 10 Oct 2017 David Casserly - The Real Knights Templar. Tue 12 Sep 2017 AGM and members’ reports - a review of the year’s visits, outings and projects. Doreen Jolly will lead a short history walk at 13:30. Tue 08 Aug 2017 Martin Baggoley - Murder on the High Seas. Sat 15 Jul 2017 Visit to Goodshaw Chapel and Gambleside click here for details. Tue 13 Jun 2017 Hilary Ambrose - Naughty Ancestors. Tue 09 May 2017 Colin Penny - The History of Lancaster Castle. Tue 11 Apr 2017 Russell Parry - The Appley Bridge Meteorite. Tue 14 Mar 2017 Barrie Walters - We Are Stardust. Fri 03 Mar 2017 Annual Dinner - at the Seaview, Whittle-le-Woods. Tue 10 Jan 2017 Boyd Harris - The Himalayan Kingdom of Bhutan, it's people and an account of the first ascent of its mountain Chomolhari by British mountaineer Freddy Spencer Chapman (1907-1971) in 1937. Tue 13 Dec 2016 Social evening with quiz. Tue 08 Nov 2016 Ian Bagshaw - Lancashire Hotpot. Thu 10 Nov 2016 Lizzie Jones - Will be performing a new costume dramalogue 'Margaret Paston' a mediaeval wife based on the ‘Paston Letters’ 7:30 p.m. St. Laurence Parish Church Chorley. Tickets £5 incl. refreshments. Book via 01257-481006 after Sep 16. Mon 17 Oct 2016 London & Bletchley Park (CHAS group trip) Bletchley Park home of the code breakers and the Museum of London for "Fire! Fire!" exhibition & Thames + Greenwich. Optional British Museum & new exhibition, "The Real Atlantis." Tue 11 Oct 2016 Malcolm Tranter - Ports of Lancashire. Tue 09 Aug 2016 Alan Davies - Mining & Art from Ancient Egypt to Modern Times. Joint walk with Chorley Family History Soc. Lead by C.H.A.S. Tue 14 Jun 2016 Keith Warrender - Battle for Kinder Scout. Tue 10 May 2016 David Ratledge - Roman Roads in Lancashire. Tue 12 Apr 2016 Stephen Caunce. - Hiring Fairs of the North West. Tue 09 Feb 2016 David Casserly. - Gladiator – life and death in the arena. Tue 12 Jan 2016 Diving into History by Boyd Harris. - Excavating the underwater wreck of the 'Mary', the first Royal Yacht. Sunk of the Skerries, Anglesey in 1675 and discovered in 1971. Excavations by Chorley Sub-Aqua Club and Merseyside Sub-Aqua Club. Also, diving on the remaining sunken wrecks of the German Fleet scuttled in Scapa Flow, Orkney Isles 1919. Tue 10 Nov 2015 Mr. Bill Taylor. - Private William Tomlinson, the Indian Mutiny and The Third Opium War. Tue 13 Oct 2015 Mr. John Doughty. - The Lancashire Witches "A Not Guilty Verdict". Sat 12 Sep 2015 Heritage Open Day - CHORLEY UNITARIAN CHAPEL, Park St. Chorley will be open to visitors from 12 noon to 4-00pm Doreen will be available to talk about the history of the church. Tue 08 Sep 2015 A.G.M. and members’ reports – a review of the year’s visits, outings and projects. Tue 11 Aug 2015 Mr. Gregg Butler. John Harkness of Preston, Ballad Printer and his work. in July 2015 No meeting. 2015 Visit to Stirling to visit Stirling Castle, Bannockburn Museum, Falkirk Wheel and the Antonine Wall. A Channel5 programme of Stirling Castle, home of kings and felons can be seen here. See News & Views May 2015 for more information. Tue 12 May 2015 Mr. Jonathan Ali. How to read a War Memorial. Tue 14 Apr 2015 Mr. Graham Stirrup. Animals at War. Tue 10 Mar 2015 Mr. David Casserly. Civil Wars in Lancashire 1641-1651. Tue 10 Feb 2015 Dr. M. Turner. History of Rolls Royce. Tue 13 Jan 2015 Dr. E. Isaac. Man on the Moor. Thu 27 Nov 2014 Lizzie Jones "Hatched, Matched and Dispatched"
Tue 11 Nov 2014 Nigel Hampson. Titanic Talks. Tue 09 Sep 2014 A.G.M. and members’ reports – a review of the year’s visits, outings and projects. Tue 12 Aug 2014 Margaret Dickinson. Yorkshire’s Ancient Secrets and Curiosities. No July CHAS meeting in the Library. See below for a local history outing. Tue 08 Jul 2014 Neil Birtles. History walk around Rivington Village. meet at 7-30 pm Rivington (top) barn. Tue 10 Jun 2014 Adam Cree. 'Susannah Knight' Chorley’s heroine who successfully campaigned to get recognition for local men who lost their lives in the First World War and also responsible for the Astley Hall Memorial Book. Due to sickness Derrick Walkden will not be able to talk about Heraldic Glass in St John’s Minster, Preston. Tue 08 Apr 2014 David Hill. The Crystal Palace. Tue 11 Mar 2014 Peter Watson. Dimensions of Time. Tue 11 Feb 2014 Stephen Halliwell, Moses Holden 1777-1864. Astronomer and much, much more. Tue 14 Jan 2014 Boyd Harris - People and Mountains of Inner Dolpo and Shey Gompa, Nepal. Plus early explorers of the Himalayas. Tue 10 Dec 2013 Social evening with quiz. Thu 28 Nov 2013 LIZZIE JONES - presenting Lady Ann Clifford, at Hollinshead Street Church. 7-30p.m. Tickets 01257 481006. £4 incl. refreshments. This Is a joint visit for the Yorkshire Vernacular Buildings Study Group (YVBSG) and Chorley Historical Society to Hoghton. Sat 14 Sep 2013 Heritage Open Day - CHORLEY UNITARIAN CHAPEL, Park St. will be open to visitors from 12 noon to 4-00pm Doreen will be available to talk about the history of the church. 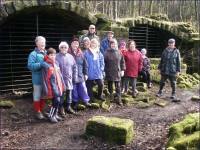 Sun 15 Sep 2013 Heritage Open Day - Neil will be leading a walk around Rivington. Meeting at the Lower Barn 1-30 pm. parking on the road up to the top barn. Tue 10 Sep 2013 AGM and Members' Reports - a review of the year's visits, outings and projects. The minutes of last year's meeting (2012) can be seen by clicking here. Mon 02 Sep 2013 Society visit to London - Visiting Blenheim Palace on way and the Pompeii Exhibition the day after (Life and death, Pompeii and Herculaneum at the British Museum). 2 cancelations, due to sickness if anyone would like to join us please contact Christine Harrison on 01257 271257 for full details. Thu 11 Jul 2013 Society evening visit (7pm) to Turton Tower. The Tower is on Chapeltown Road in Turton, has a car park and will be opened at 7pm. The tour should take about an hour, to an hour and a quarter. The building is a tower house, probably originating in the 15th century, and later owned by the Chetham and Kay families. The If you arrive 30 minutes early you could walk up to see one of the quasimedieval railway bridges with crenellated towers and arrowslits, built when James Kay owned Turton Tower and was a director of the railway company. Tour cost is £5. Sat 26 Jan 2013 Whittle-le-Woods re-lives the Queens’s Jubilee and also dips in to the Whittle photo archive. Saturday 26 Jan 2013 at 7:00pm. All are welcome and the evening is free with donations on the door. Light refreshments will be available during the interval. Sat 08 Sep 2012 Chorley Unitarian Chapel, Park Street, Chorley, PR7 1ER. A guided tour as part of the Heritage Open Days Weekend by our own Doreen Jolly. Sat 07 Jul 2012 Society coach trip to Wainhouse Tower, Halifax + Undercliffe Cemetery, Bradford. Unfortunately this event has been cancelled due to insufficient numbers. 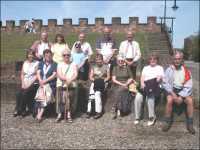 Sat 17 Sep 2011 Historical tour of Chorley Unitarian Chapel by Doreen. Meet at the Chapel at 2pm. Want to learn more about the history of Chorley Cemetery ??? ?, the people who created it? the connection to the famous Undercliffe Cemetery in Bradford and a friend of Florence Nightingale? Join our tour of the graves, vaults and memorials to many of Chorley’s 19th century leaders from the fields of politics, law and local government, industry, the church and medicine. Their stories will be briefly told…..and the occasional scandal uncovered! Meet outside the Lodge at 1.30pm on Saturday 10th September. (Park across Southport Road, outside Parklands High School.) Click here for an illustrated leaflet. (SD 595 174) on Crosse Hall Lane. Turn off Eaves Lane at the Shepherd’s Arms. Parking is on the left hand side of new road, (Haworth Road) adjacent to St. James’s School playing fields. The walk of about 3 miles will follow a figure of eight route for approximately 2.5 hours, and will be mainly on paths. Sensible walking shoes are advisable. The walk will not be peaceful or especially scenic but will be looking at an area that has been of importance at different periods in the history of Healey.....and its neighbour, Chorley. Contact John Harrison (cejeharrison@btinternet.com or 01257 271257) if you need further information. Lieutenancy of Lancashire - What's the difference? Thu 07 Jul 2011 Evening visit to Browsholme Hall nr Clitheroe. 6:30pm at the hall. Tue 08 Mar 2011 Mike Emery, Andrea Kenyon and David Cole - So you want to be a Magistrate? Including new information since the 11 Nov 2003 presentation. Thu 02 Dec 2010 Lizzie Jones returns to Astley Hall to present MRS. CROMWELL. All tickets sold out. Tue 14 Sep 2010 Annual General Meeting and Members reports - a review of the year's visits, outings and projects. Tue 20 Jul 2010 Members and guests of the society are welcome to join us on an evening visit to Bank Hall, Bretherton on Tuesday 20 July, 2010. We will be the guests of Bank Hall Action Group. Make your own way to Bank Hall and be there for 7.30pm. There is no charge. Tue 11 May 2010 Janet Edwards, Bank Hall Action Group – Bank Hall and the Banastre Family. Sat/Sun 8/9 May 2010 Mike Berry - New Lanark World Heritage Site week-end. Fri 05 Mar 2010 Annual Dinner at the Seaview, Whittle-le-Woods. Tue 12 Jan 2010 John Virgoe - Basil Thomas Eccleston (c1712 - 1789) of Eccleston, Eighteenth Century Squire Farmer and Diarist. Tonight's speaker, Donna Hughes, has cancelled due to the snow. An alternative speaker has been found. Sun 13 Sep 2009 Heritage Open Day - CHAS walk, Bretherton, Pompian Brow (PR26 9AQ), near junct with South Road 1pm. Lancashire events list here. Location map here. Tue 09 Dec 2008 Christmas meeting - social event, buffet and hopefully a quiz. Tue 14 Oct 2008 Dot Bruns of the The Portable Antiquities Scheme gives an illustrated talk on coins through the centuries that have been found in Lancashire & Cumbria. Plus an update on the cataloguing of the John Winstanley flints. Tue 09 Sep 2008 Annual General Meeting and Members Reports. Plus a slide show of outings and visits through the year. Sun 31 Aug 2008 Local field walk. - Botany and Limbrick. 1:30pm meeting place Motorway bridge area, Botany, Botany Brow. Tue 12 Aug 2008 Darren Cranshaw - The Brindle Estate and the Cavendish Family. Sat 02 Aug 2008 Lancashire Family History and Heraldry Society at Astley Hall. 11am - 4:30pm CHAS propose to have a stand there. Tue 08 Jul 2008 No Meeting. Sun 29 Jun 2008 Local field walk. - Please note, this walk has been cancelled. If anyone wants to volunteer to run a walk please contact the Secretary. Tue 10 Jun 2008 Glen Atkinson - 'Digging the Big Ditch' A lantern slide presentation of the construction of the 36 mile Manchester Ship canal which opened in 1894. Sun 18 May 2008 Local field walk. - The Street to Lead Mines Clough. 1:30pm meet embankment near the Yew Tree. Tue 13 May 2008 Barry Lowe - Remembering the Chorley you thought you knew. Sun 27 Apr 2008 Coach outing to Port Sunlight. - Conducted tour & lunch etc. Coach pick up outside Chorley Railway Station, time to be arranged. Tue 08 Apr 2008 Joan Langford - Farington Cotton Mill. Sun 30 Mar 2008 Local field walk. - White Coppice/Heapey low level. 1:30pm meet White Coppice Cricket ground. Fri 07 Mar 2008 Annual Dinner at the Seaview, Whittle-le-Woods. Tue 12 Feb 2008 Steve Williams of Brindle Historical Society gives an illustrated talk on "The Chorley Pals remembered 1914-1919"
at Coppull Moor Ln / Hic Bibby, Coppull. 10am. nearest postcode is PR7 5JB 50m east of the site. Due to a recent land ownership change we have had to postpone the search due to not being able to get land access permission. Tue 13 Nov 2007 Ed Fisher - An Illustrated 'virtual' tour' of St Laurence, the Parish Church of Chorley, including many people associated with it's long history. Tue 09 Oct 2007 Dot Bruns of the 'The Portable Antiquities Scheme' - An illustrated presentation on 'The Portable Antiquities Scheme' a system of recording objects collected by members of the public. Tue 11 Sep 2007 Annual General Meeting and Members Reports. Plus a slide show of outings and visits through the year. Sun 09 Sep 2007 Chorley Town Centre Heritage Trail - official opening. Meet on the 'Flat Iron' Union St., 12:30pm for the guided tour. Tue 14 Aug 2007 Stephen Sartin - Recent Acquisitions of the Judges' Lodgings Museum, Lancaster. Tue 10 Jul 2007 No Meeting. Tue 12 Jun 2007 Derek Forrest - A Roman Soldier in Lancashire. Tue 08 May 2007 Rachel Newman - Director, Oxford Archaeology North. - Recent work including a Viking burial ground in Cumbria. Sun 29 Apr 2007 Shap Abbey outing. - (mini-bus) Conducted tour of Shap Abbey, Cumbria then Brougham Castle, Penrith. Meet 10am Chorley Rly. Station lay-bye. Fri 09 Mar 2007 Annual Dinner at the Seaview, Whittle-le-Woods. Dot Waring - Digging for the Romans - excavations on the Roman Road at Darwen. Tue 12 Dec 2006 Local Quiz and Social Evening. Wed 06 Dec 2006 Lizzie Jones returns to Chorley with Astley Hall as the venue 7:45pm (ticket only) - presenting The Winter Queen. Tickets 3pounds. Tue 14 Nov 2006 Harry Yeadon, former Lancs. County Council County Surveyor. Development of the Motorways in Chorley and Lancashire. Tue 10 Oct 2006 David Ratledge - The Roman Roads of Lancashire. Sun 13 Aug 2006 Chorley Parish Church of St Laurence 10am service. Review of new Church inventory. Tue 08 Aug 2006 Ben Edwards, former Lancashire County Archaeologist - The Cuerdale Hoard, an enormous Viking cache of 8000 silver coins and bullion. Sun 14 May 2006 (photos) Local Field Walk - 1:30pm Clayton-le-Woods, Clayton Green, Cuerden. Meet Community Centre, Spring Meadow off Lancaster Lane, C-le-W. loc. map. Tue 09 May 2006 Stephen Sartin. Recent Acquisitions of the Judges' Lodgings Museum, Lancaster. Tue 11 Apr 2006 Barry Lowe - An interesting view of historical aspects of Chorley. Thu 30 Mar 2006 (photos) Society visit to The Mayor in the Mayor's Parlour, Chorley Town Hall 7pm. Numbers are limited so book early. Fri 10 Mar 2006 (photo) Annual Dinner at the Seaview, Whittle-le-Woods. Tue 14 Feb 2006 History of the Leeds and Liverpool Canal by Mike Clarke. Mike is the author of the definitive history book on the canal. Not to be missed. Tue 10 Jan 2006 Roman Roads and settlements of Wigan by Bill Aldridge of Wigan Historical Society. Tue 13 Dec 2005 Local Quiz and Social Evening. Tue 08 Nov 2005 'Some Local Vernacular Buildings' J. Smith. Sun 23 Oct 2005 (photos) Field Outing (minibus) Norton Priory. meet 10:30 Rly Station lay-bye. Tue 11 Oct 2005 'Tide Mills in England and Wales' by John Virgo from Parbold. Tue 13 Sep 2005 Annual General Meeting and Members Reports. Tue 09 Aug 2005 'Some interesting Tower Clocks' S. Whillis. 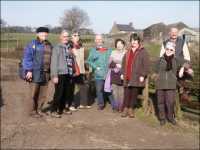 Sat 06 Aug 2005 Social history of Withnell Fold guided walk. Book via Lancashire County Archaeology Service. Sun 26 Jun 2005 Annual Coach trip to York using public coach. Tue 14 Jun 2005 'What the Workhouse did for us' M. Ramsbottom. Tue 10 May 2005 The scheduled talk was cancelled so Jack Smith gave a talk. Sun 17 Apr 2005 Local Field Walk - Worthington and Haigh. Tue 12 Apr 2005 'North Country Folklore' Dr P. Watson. Sun 27 Mar 2005 Field Outing (cars). Horwich - Wilderswood. Thu 17 Mar 2005 (photo) Visit to the North West Film Archive, Manchester. 10:30am at the Archive. Sat 12 Mar 2005 (photos) Blackburn Museum conducted tour inc. Jessica Lofthouse exhibition. 10:00am start. Tue 11 Jan 2005 'Lancashire Textiles - Conservation Issues' Peter Iles. Tue 14 Dec 2004 'Artefacts and Collectables Miscellany' Followed by a Social Evening. Tue 09 Nov 2004 A research paper on 'Local Roman Period Associations' will be presented by J. Smith the society secretary, then discussion. Tue 12 Oct 2004 'Fourty Years of Lancashire Archaeology' B. Edwards. all of Aug 2004 Chorley Library. Golden Jubilee exhibition. 50 years of Chorley Historical and Archaeological Society. Sun 22 Aug 2004 Field Walk, Walton-le-Dale and Canal Tramway. Meet 13:30 W-le-D, Walton Green. Field Walk Horwich Moor. Meet 13:30 Georges Lane end. We explored the jistory of the Matchmoor Lane area and then up to the moors and the site on an old Kiln at Hole Bottom, just by the Winter Hill mast access road. Then up to the Two Lads cairn. Tue 08 Jun 2004 The Work of the North West Sound Archives. A. Schofield. Field Walk - Adlington / Anderton area. Meet 13:30 Lower Adlington. Annual Dinner at the 'Seaview' Whittle-le-Woods. 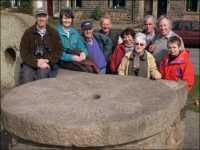 Sun 14 Mar 2004 Field Walk - Wheelton Moor (Mear Stones) Meet 13:30 Brinscall Baths. Good walking boots needed. A wet morning cleared and we had clear but windy weather for our walk. 14 of us walked up through the woods, stopping at the various ruined farmhouses to remember the people who lived there. Previous reference to the 1881 census gave us their names and occupations. The 2 remaining mear stones (boundary stones) were seen and possible explananations discussed as to who made them. Tue 09 Dec 2003 Social Evening. Sun 21 Sep 2003 Local Field Walk: Anglezarke Moor. Sun 14 Sep 2003 Heritage Open Day: Social History of Withnell Fold. Meet at Methodist Chapel 2pm. Over 60 people turned up for the history talk and walking tour of the village. A beautifull warm and sunny day helped make this a great afternoon. Sat 13 Sep 2003 Heritage Open Day: Conducted tour of a Coppull Mill by Jack Smith. I wasn't able to attend this tour due to family commitments but I believe it was well attended and enjoyed by all. BH. Tue 09 Sep 2003 Annual General Meeting & Project Reports. Sun 17 Aug 2003 Field Outing:Lathom Chapel & Hall Site. Sun 29 June 2003 Another warm and sunny day for the Society's outing to Manchester, Castlefield Roman Fort and the various museums nearby. <- click on the image for a larger version. Sun 13 Apr 2003 A warm sunny day for our excellent walk along part of the length on the Lancaster Canal through Whittle-le-Woods. Jack Smith provided the commentary. The group is posing by the Whittle millstones monument. Sun 16 Mar 03. We were very lucky with having a warm sunny day for our historical field walk in the Anderton area. Jack Smith outlined previous work done on the possible routes of Roman Roads in the area and pointed out where they may have passed through local scenery. Tue 10 Dec 2002 Members reports and social evening. Replaced with an excellent talk by Jack Smith on the history of local railways.